Hexahydrobenzlcarbonate 100 for intramuscular injection, contains Trenbolone. 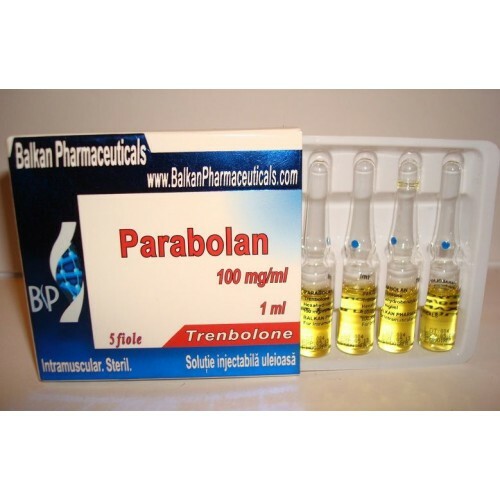 Trenbolone is a fast acting injectable steroid. Bodybuilders have been known to use the drug in order to increase body mass more effectively than by weight training alone. A normal bodybuilding dosage can range from 200 mg/week up to 1400 mg/week. Due to the relatively short metabolic half-life of trenbolone acetate, dosages should commonly be split into injections at least once every two days. Trenbolone enanthate can be injected once a week. Trenbolone compounds have a binding affinity for the androgen receptor three times as high as that of testosterone. Once metabolised, the drugs have the effect of increasing nitrogen uptake by muscles, leading to an increase in the rate of protein synthesis. It also has the secondary effects of stimulating appetite, reducing the amount of fat being deposited in the body, and decreasing the rate of catabolism. Trenbolone has proven popular with anabolic steroid users as it is not metabolised by aromatase or 5?-reductase into estrogenic compounds such as estradiol, or into DHT. This means that it also does not cause any water retention normally associated with highly androgenic steroidal compounds like testosterone or methandrostenolone. It is also loved by many for the dramatic strength increases commonly experienced with it. Some short-term side effects include insomnia, high blood pressure, increased aggression and libido. However, since women will suffer virilization effects even at small doses, this drug should not be taken by a female. Urban wisdom/myth in bodybuilding culture, states that the use of the drug over extended periods of time can lead to kidney damage. The kidney toxicity has not yet been proven, and scientific evidence supporting the idea is suspiciously absent from the bodybuilding community that perpetuates this idea. The origin of this myth most likely has to do with the rust colored oxidized metabolites of trenbolone which are excreted in urine and often mistaken for blood. After Schänzer (Clin Chem 1996; 42(7): 1001-1020, Metabolism of anabolic androgenic steroids) trenbolone and 17epi-trenbolone are both excreted (in urine) as conjugates that can be hydrolyzed with beta-glucuronidase. This implies that trenbolone leaves the body as beta-glucuronides or sulfates, that means mostly non metabolized.